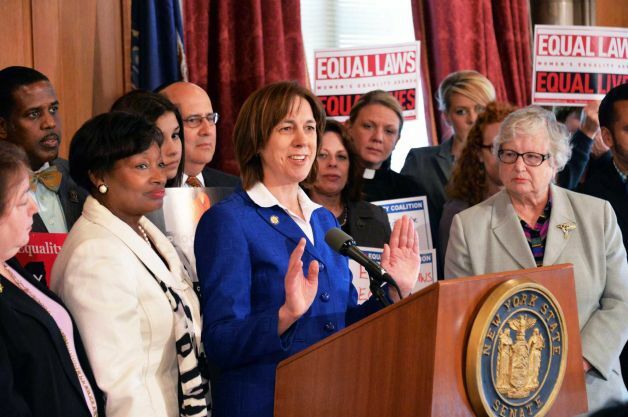 at the Capitol in Albany, N.Y.
ALBANY, N.Y. (AP) A series of bills dubbed the Women's Equality Act were reintroduced Tuesday in the New York Senate after the package was derailed last year over a contentious late-term abortion proposal. Senate Democrats introduced 10 bills that cover topics like reproductive rights, pay equity, sexual harassment, human trafficking and tougher order-of-protection laws they say are necessary to protect women. "Women are 52 percent of the state, we aren't supposed to be 80 percent of a human being," Sen. Liz Krueger, a Manhattan Democrat said. "We're not supposed to earn less than men for the same jobs." Advocates and lawmakers used The New York Times' decision last week to replace Jill Abramson, who was reportedly making less money than her male predecessor, as a reason for the need of these set of laws. The paper has denied her compensation package was less than her predecessor's. The abortion measure is billed by supporters as simply matching 1970 state law with the less restrictive Roe v. Wade decision of 1973. Supporters wanted the state law to match federal law because they fear the federal law will be struck down, saying it would do nothing to change abortion as now practiced. A spokeswoman for the Senate Republican Conference said the abortion measure would allow non-doctors to perform abortions up to the day of the baby's birth and Democrats are putting party politics over the health of New York women. "We will continue to work to enact our women's agenda into law, but we won't let reckless Senate Democrats jeopardize the health and safety of women, nor will we let them endanger their basic reproductive health just to make a political statement," spokeswoman Kelly Cummings said. Last year Senate Republicans defeated a surprise amendment that would have forced the chamber to consider the abortion measure, resulting in the passage of nine bills. Assembly Speaker Sheldon Silver said he wouldn't consider the nine bills without the abortion measure. "All ten points were the result of negotiations between the Assembly and the Senate," Sen. Ted O'Brien, a Rochester Democrat, told the Associated Press. "In some respects some were watered down in the spirit of compromise." When repeatedly asked, the minority conference reiterated that breaking apart the package to vote on the bills individually is not an option.